Many of you know that in Latin America the rules of the road are mere suggestions. 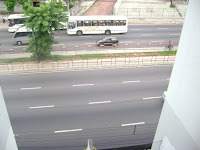 Let me give you idea of what it is like to drive in Belém, Pará, Brazil a city of about two million people. We leave our apartment in the mornings to head to school. Now this is no small feat, for people here will park almost anywhere. In our parking garage alone, which is about the size of a basketball court, you will find five cars and our S-10 four-door five speed (yes, almost all vehicles are standard not automatic) pick-up. On the side street (about 50 feet long) on the way out to the main street, you will find another five to six cars parked anywhere possible. So, we finally make it to Ave. Almirante Barroso, a eight-lane surface street. However, we must be careful when entering the street for several ton buses are barreling down on us since a bus stop is almost in front of our building. With the squeal of tires we make it out and the race begins. For the next several miles until we get to our destination, we must weave in and out of traffic to stay safe and to make it to our destination safely. During this trip, most vehicles ignore the lane lines on the road, if they even exist, and drive wherever. Yes, often at a stoplight (for which most vehicles stop) you will find four-five car wide traffic on a three lane road. The use of your horn is a must and being an aggressive driver is not rude, it is actually expected. Motorcycles are another interesting addition to the fray. For, you see, they are taught in traffic school to drive between vehicles. Not only this but you will find every sort of delivery driver possible on a motorcycles… yes, water, food, beer, and even portable gas tanks (for cooking). I have even seen a FrED-EX delivery man on a motorcycle (and no this is not spelled incorrectly, no trademark infringement here). However, we are thankful for our vehicle which our mission kindly provides and we enjoy the challenge of the road most day.